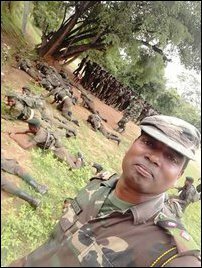 Selfies of school-going Tamil children as young as 15-years from Uruththirapuram in Ki’linochchi and from Jaffna, including from the prestigious colleges such as Jaffna Central, have surfaced in the social media revealing ongoing silent recruitment to the occupying Sinhala military of genocidal Sri Lanka in recent days. The building of one of the key native Tamil academic institutions, that evolved in Jaffna to protect the native language and heritage against European colonialism, the Arya Dravida Bhasha Viruthi Sangam (Academy for the Development of Aryan and Dravidian languages) located at Koddaddi in Jaffna, has become the secretariat for the occupying Sinhala military to recruit Tamil children. Questions have arisen on ‘silent advice’ to SL military on the move was coming from Colombo-based foreign missions that sustain seek to sustain the ‘uniformity’ of genocidal Sri Lanka. The recruited children and students are being sent to South for training at military training bases. The Northern Provincial Council’s Education Ministry has not been consulted on the controversial issue. Eezham Tamils who regard the Sinhala military as the tool of the protracted genocide, have not volunteered to military recruitment at any juncture. But, they are lured with various ‘advantages’ such as a point-system giving benefit in employment, informed sources said. In the past, even those who had been recruited to SL military through deceit have managed to escape from the Sinhala military as earlier reported. Thus, the approach has now become more sophisticated. 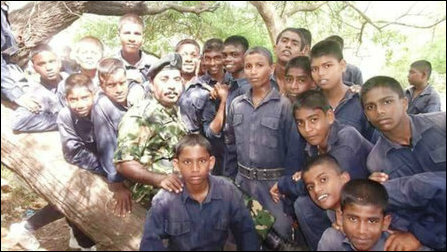 In the South, the school-oriented cadet training given to Sinhala students has traditionally been an avenue to enlist young military recruits. The tactic was to be experimented in the North starting from the times of former SL Defence Secretary Gotabhaya Rajapaksa. But, Mr Gotabhaya became more obsessed with enforcing all students entering the universities to be subjected to a so-called leadership training by the Sinhala military. 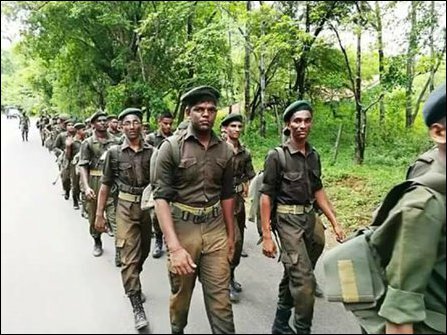 In the North-East, the ‘leadership training’ given to students became almost synonymous to ‘military rehabilitation’ imposed on former LTTE members. However, when the so-called "Yahapalanaya" government was brought to power in 2015 by the ‘strategic partners’ of US Bandwagon through the 2013 Singapore Principles paradigm, the so-called leadership training, which had earned the ire of the Tamil public, was abandoned as one of the cosmetic gestures by the agent State in Colombo. But, on the other hand, more sophisticated forms of recruitment drives targeting school children were advocated by the SL Army commander Mahesh Senanayake during his tenure as Jaffna Commander starting from January 2016. After becoming SLA Commander Lt Gen (promoted by Yahapalanaya) Mahesh Senanayake has accelerated the Cadet programme based on inputs coming from foreign Establishments. He started to claim that the Sinhala military was now becoming a ‘capacity’-based organization rather than a ‘threat’-based one, justifying the school ‘Shramadanas’ and ‘house-constructing’ (enslaving resettling Tamils) military. 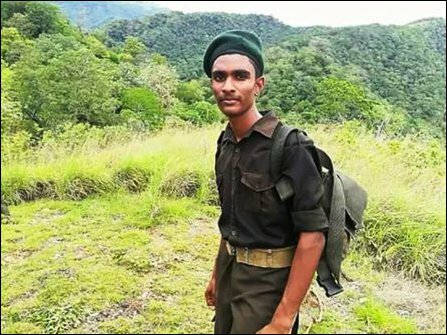 It is under this context, Tamil boys as young as 15 are now being allowed to play with firearms by the Sinhala trainers from the SL armed forces. The question is why foreign powers, having military-to-military engagement with the genocidal State in the occupied country of Eezham Tamils are showing a keen interest now in deceiving Tamil students into Sinhala military. That question has to be answered by the NPC Education Ministry, its minister and the Chief Minister of the NPC, a Tamil principal who had participated in the ‘cadet training’ told TamilNet. The principal of a reputed Tamil school, who did not wish to be named for obvious security reasons, had recently gone to study how the programme is being conducted and was shocked to see the deceptive psychological design of the scheme. The latest move has to be seen together with SL military running a school for Sinhalicisation of Tamil children at Puththoor, which was visually exposed in August 2017, when the Chief Prelate of Asgiriya Buddhist chapter visited the controversial Buddhist conversation project. NPC Minister of Education for Northern Province, K Sarweswaran when contacted by journalists in Jaffna said it was important for schools to collaborate with the NPC Ministry providing further details of the alleged hidden elements of the programme. 07.12.17 US Pacific Command complicit in Colombo’s structural genocid..
05.12.17 North-East under Sinhala colonial rule: NPC Minister Sarwesw..
10.07.17 Mayiliddi people will not succumb to SL military resettlemen..
21.02.17 Sinhala military chases 850 Tamil escapees from military sla..
21.12.13 Colombo seeks genocidal subordination through military indoc..
24.03.13 95 Tamil girls ‘alter’ the image, says 300,000 strong Sinhal..
12.12.12 SLA conscripted Tamil females admitted at Ki'linochchi hospi..
02.01.18 Sinhala military silently recruits Tamil teenagers..